I’m glad to see that the Banshee is being used more often in TvZ. Gone are the days of the 1-1-1 Banshee all in because it’s become incredibly predictable — it’s so faux pas and unfashionable now. It’s been a thousand times and everyone’s sick of it. It’s like wearing parachute pants and crab dancing. The strategies have definitely changed in the past few months. Recently, it has been all about massing up hellions, running into the Zerg base and then having a delicious Drone BBQ. Then, the Banshee happily flies in and starts ruining the Zerg’s day even more. She’s like the icing on your birthday cake. Happy Birthday, your Zerg opponent is down by 20 workers! Yay! Prep work should take about 15 minutes. Cook time should be about 20 minutes. This will serve 4 people. Season the ground beef with salt and pepper. Place ground beef in a bowl. Create patties with the meat by forming small balls. You’ll need to make about 8 patties. The balls should be no more than 2 inches in diameter. Set a pan to high heat and add a teaspoon of olive oil. Sautee mushrooms and onions. Season the mushrooms with salt and pepper. Remove mushrooms and onions and set aside. Cook for 4-5 minutes on each side. Place a slice of Swiss cheese on top of a burger patty. 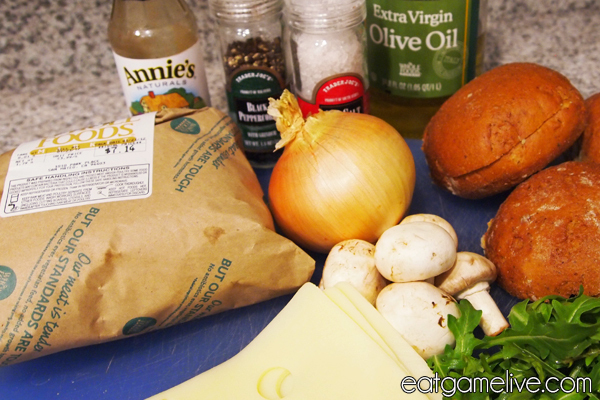 Add mushrooms and onions on top of the cheese. Place another burger patty on top of the mushrooms and onions. Let cheese melt for about 30 seconds. Remove from the pan immediately. Place washed arugula the bun. Add your double patty and Swiss cheese sandwich onto the bun. And you’re done! GG WP. This recipe is quick and easy — perfect for an IPL5 meal. Sadly, there doesn’t seem to be any more Terrans in this year’s final season of GSL. That’s OK though; Zerg needs their time to shine. So, sit back, throw some burgers on the grill (or in a pan), and enjoy the weekend tournament. 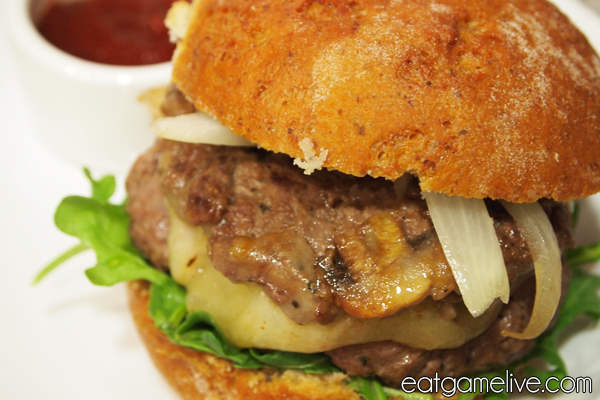 This entry was posted in sandwich, starcraft and tagged arugula, banshee, burger, swiss, terran by admin. Bookmark the permalink.